Cardio Athletic Kickbox II is ideal for 'regular' people who want to turn their home exercise session up a notch. The video starts with a demo of the kicks and punches, proper form, and advice for injury prevention. 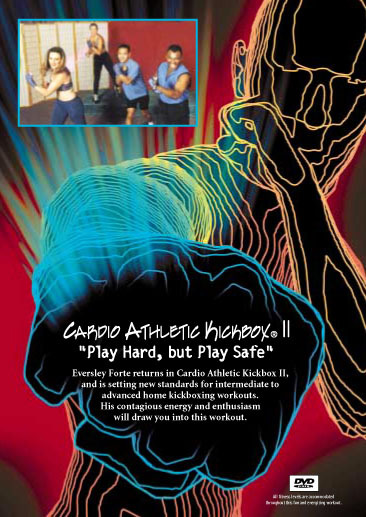 Cardio Athletic Kickbox II truly lives up to its theme of "Lets Play Hard, but Lets Play Safe®." Following the warmup, the video escalates into an aggressive, yet fun and entertaining workout incorporating boxing combinations, elbows, knees, multiple kicks, and athletic drills. Throughout the program, safety tips and correct form for various kicks and punches are given, along with options for low and moderate workout intensity. Eversley's style will be a refreshing change of pace and will motivate you to reach your goals! The video is approximately 58 minutes (VHS in PAL format).